This article was orignally published (March 2012) as the first of the Global Snapshot series, bi-weekly essays written by Protect Our Winters (POW) supporters, which give their local perspective of climate change. Protect Our Winters is doing great work in North America, but the relevance of this work has global implications and should have parallels in any country with a snow industry. It would be great to see POW able to expand globally or to see something similar in the southern hemisphere giving a voice to snow based industries to compliment the many not-for-profit organisations in these areas pushing for climate change action. Now Australia is not renowned for its winters or its snow but we do have a reasonable snow industry and a unique mountain environment that is at huge risk from climate change. Our relatively small snow industry, on a global scale, is based around a short and at times fickle snow season and really only has 5 major ski resorts, owned in one way or another by just two major power players within the Australian business world (Alan Rydge and the Packer empire). However, we have produced some world class winter athletes such as Chris Booth, Torah Bright, Anna Segal, Russ Henshaw, Nate Johnston and many others who first got a taste of snow in the Australian Alps. In addition, we are just a stone’s throw away from the amazing southern alps of New Zealand, which some people here in Australia consider to be just an extension of our available winter playground. A large part of our ski industry, particularly with our current high value currency, involves Australians travelling overseas as snow tourists and on working holidays to other skiing destinations. The home of our snow industry is a unique and highly specialised sensitive alpine environment. So sensitive is much of our alpine environment that motorised vehicles of any kind are basically not allowed outside of the resort boundaries. This environment is unique partly as a result of the old age of the mountains and lack of mountain building, being in the middle of a continental plate. Only minor glacial activity has occurred, being last present between 10,000 and 30,000 years ago. The total area of the true alpine environment (above the tree line) is small, approximately only 770 km2, which is found as a series of ‘islands’ on top of mountains within a sub-alpine ‘sea’. In the order of some 6,500 km2 of alpine and sub-alpine areas annually receives some snowfall. Our endemic alpine species have largely evolved in isolation from other continents and often on isolated mountain tops only tens of kilometres apart. Species such as the Mountain Pygmy-possum (Burramys parvus) and Broad-toothed Rat (Mastacomys fuscus) and vegetation communities such as the short alpine herbfields, alpine bogs and peatlands have very narrow environmental tolerances. As a result of climate change our alpine specific species and communities are in real danger of quite literally being pushed off the top of our mountains, having nowhere to migrate to and no ability to move from or between these ‘alpine islands’. Climate change is a global issue and Australia is a big polluter. Australia is among the top carbon polluters in the world and within the OECD (Organisation for Economic Co-operation and Development, of which United States of America is a member), Australia is the highest per-capita emitter of carbon dioxide. This is mainly a result of our reliance on coal for electricity and high per-capita agricultural emissions. In the high Australian Alps from 1950 to 2007 there has been an increase in winter temperatures approaching 1°C and over much the same period, 1957 to 2011 (the time that snow data has been collected), Australia has seen a slow decrease in snow depth. The mid-winter snow depths have only decreased a small amount, whereas spring snow depth has dropped by almost 40%. The seasonal variations in the decreases in snow depth have also varied in relation to altitude. These observations are beyond explanation here, suffice to say they are attributed in large measure to increases in temperature and to a smaller degree, a slight drop in precipitation, both considered a result of changing weather patterns due to climate change. 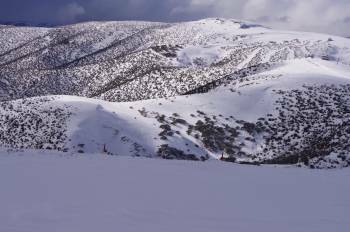 These changes in snow fall also have wider economic implications for Australia as the spring snow melt is very important for the Australian hydro-electric and irrigation industries, to the extent that cloud seeding is now regularly undertaken to boost precipitation in the dam catchment areas within the Australia Alps. Happily Australia has recently put into place a price on carbon which will come into effect in July 2012. This is a first step in encouraging the use of alternatives to heavy carbon polluting industries such as coal based electricity production. However, our current major opposition political party, bandying to the big polluters, has committed to removing this carbon ‘tax’ if they win the next election in 2013. The price on carbon is seen as very controversial and is opposed by large sectors of Australian industry, particularly the mining industry which forms a large part of our GDP and the manufacturing industry, as the high Australian dollar is already making competition in the global market difficult. With our large land mass, relatively small population size and world leading research and development Australia is well placed to lead advancements in using renewable energy sources. However, due to the very low cost of coal and lack of pollution charges, Australians have become used to very low electricity prices which has made a shift to renewables politically difficult. In 2010 in the order of only 9% of Australia’s electricity was produced by renewable sources, of that hydro made up approximately 63%, wind 23%, bioenergy (use of biomass) 11%, photovoltaic 2% and others <1% with research ongoing into other renewable energy sources such as geothermal and solar thermal. Although not producing electricity but still saving it, solar hotwater systems account for up to 7% of clean energy production in Australia. As one of the world’s sunniest countries and one that has developed much of the current leading photovoltaic technology it seems crazy that Australia does not have a larger solar industry than it does. In a move completely at odds with the introduction of a carbon price and a push for the use of renewables, in many Australian states, subsidies that were successfully promoting the use of solar electricity in homes have recently been removed. So like most of the world we have a long way to go with climate change and many areas including our sensitive alpine environments are in need of action now. Not only for their protection but also the protection of our unique snow industry and other industries associated with the Australian Alps. Hopefully Australia can help lead by example through its introduction of a price on carbon pollution and encourage other countries to start taking similar action on climate change. Concerned world citizen, ecologist, Director of Total Eco Adventures, keen snow enthusiast and supporter of POW. The carbon tax was clearly the wrong way to go. All it resulted in were higher end prices for the consumer, in no way did it encourage businesses to reduce emissions. The real way to go about it is to offer incentives to business to reduce their emissions, or fund infrastructure projects such as solar farms like those in California.